The BLM’s HORRIBLE project goal is to maintain a population of only native 25-30 wild horses within the Water Canyon portion of the Antelope HMA. The current estimated population is only 66 wild horses. Under the proposal, the BLM would capture the horses through bait and water trapping or by helicopter roundup, and treat and release only 25-30 wild horses back into the project area. Mares selected for release would be treated with PZP-22, a time-release pesticide for birth control (made from slaughterhouse pig ovaries) with an expected efficacy of about two years, despite the fact that it sterilizes after multiple use. The mares would be re-treated every 20-24 months and monitored to determine treatment effectiveness. Despite the current low population, BLM trumps up allegations of “excess wild horses” to justify a waste of tax dollars and permanently remove traumatized herd members by offering them to the public through a trap site adoption. The Bureau of Land Management (BLM) Ely District, Schell Field Office is soliciting public comment on the Water Canyon Wild Horse Growth Suppression Pilot Program Preliminary Environmental Assessment (EA). The Preliminary EA (DOI-BLM-NV-L020-2015-0014) was made available for review and comment on Friday, May 15, 2015. The 30-day comment period concludes Monday, June 15, 2015. Comments will be accepted for 30 days until June 15, 2015. Interested individuals should address all written comments to the BLM Ely District Office, HC 33 Box 33500, Ely, NV 89301, Attn: Paul E. Podborny, Schell Field Manager, or fax them to Podborny at (775) 289-1910. Comments may also be submitted electronically at blm_nv_water_canyon@blm.gov or comment throught the NEPA Register. Email comments sent to any other email address will not be considered. Before including your address, phone number, e-mail address, or other personal identifying information in your comment, you should be aware that your entire comment – including your personal identifying information – may be made publicly available at any time. 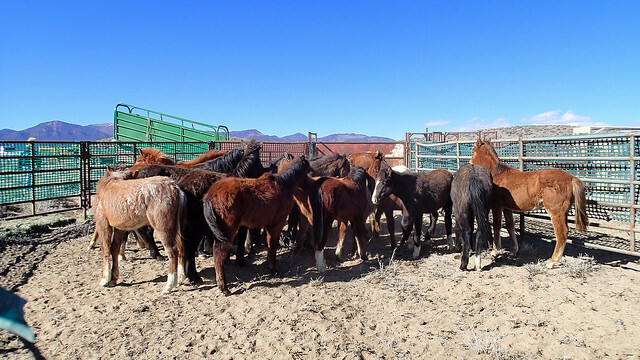 The EA analyzes a proposal to conduct a pilot project to gather, and treat and release, as well as remove excess wild horses from inside the Water Canyon area, located within the Antelope Herd Management Area (HMA), about 60 miles north of Ely, Nevada.